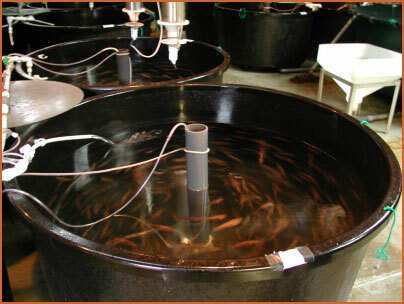 The Seafish Industries Research Station in Scotland is studying fish farming. To stay healthy the fish need a continuous flow of water so the Station pumps 110 tons of seawater per hour into their tanks. Monitoring and maintaining this recirculating flow is essential, and to ensure this they chose a Windmill Software system. The system monitors water temperature, air temperature, water flow rate, dissolved oxygen concentration, salinity, pH, light level, water level and various alarm switches. Windmill provides mimic displays of the site showing pictures of the tanks and their current data values. Every 30 minutes the software logs the data to the computer's hard disk. It is extremely important that alarms are raised when conditions fall below optimum. Windmill lets the researchers set thresholds which when crossed cause an audible alarm to sound on site, and an autodialler to telephone engineering staff who may be off-site. The alarm thresholds can be set for individual measurements, with delays if necessary before alarms are signalled. For example, oxygen level can have two set points. The level might have to fall below the first point for 15 minutes before an alarm sounds, but if it drops further to below the second point an alarm will sound immediately. A computer running Windmill broadcasts its data values over the site network using the Windmill Repeat program. Each department can therefore log their own data sets, incorporating data gathered both locally and around the site. The monitoring equipment, from which Windmill reads the raw data, comprises Microlink 1500 units. These communicate over RS485 serial links allowing the equipment to be up to 1 kilometre away from the PC. Future versions of the system will allow remote monitoring over the Internet. The Research Station needed a system that was reliable, expandable, easy-to-use, could be operated remotely and didn't cost the Earth. Windmill Software met all these requirements and is helping ensure a healthy fish population.